We now present Episode 9 of Web Zeroes, Intervention. In this episode, Ray gets addicted to World of Warcraft, and Nate and Alex have to go to exotic lengths to bring their friend back to reality. As many of you who saw the original videos can guess, this is a spin on an old idea. We thought it would be more interesting to see Ray out of his element, since he’s kind of the glue that holds the entire ship together. I think there are some hilarious results. We’re starting to enter the last leg of the season, which is more than a little wild. In fact, we’ve almost got filmed up through Episode 12, and we’ll be working on Episode 13 (the finale) a little this week in Austin. Web Zeroes really is an entirely different experience from Leet World, one that I’ll have to write more about at a later time. For now, hit the jump to see the episode! 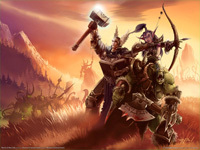 This entry was posted in News, Web Zeroes and tagged austin, intervention, leet world, web zeroes, world of warcraft on December 2, 2009 by Eddy. Alright, gents and ladies. Here’s Episode 7 of Web Zeroes, Marathon Men. In it, the dudes try to do a video game marathon for charity, and Ray meets a hobo with quite a story. Also, there is World of Warcraft. We really like this episode, and hope you guys do, too. It takes place in me and my wife’s new home (our first! ), so there’s a change of setting from the rest of the series. In addition, you should check out the Child’s Play charity, because they do awesome things for kids in hospitals by providing them video games. For real, look them up. Much thanks to our friend Miles for his excellent performance in this episode, as well as Jace for once again making things rule with his music. Hit the jump to see the episode! This entry was posted in News, Web Zeroes and tagged childs play, duke nukem forever, hobo, left 4 dead 2, marathon men, web zeroes, world of warcraft on November 18, 2009 by Eddy.